Augment, a Paris-based Augmented Reality (AR) startup announced this morning that they raised more than $3 million from Salesforce Ventures to further expand company operations and also specific integrations with Salesforce software. This brings the total investment amount raised since launch to $4.7 million. Augment’s AR software, which is built on PTC’s Vuforia platform, has both B2B and consumer implementations, however the B2B model seems the most interesting and the one with the most runway. Their B2B offering specializes in helping vendors visualize product placement for the merchants with whom they work. For example, a brand rep can help a merchant visualize—prior to ordering—which product end cap to choose and what it will look like when integrated into the store location. Augment’s AR technology itself is not necessarily something we haven’t seen before. In many ways, it reminds me of AR demos I’ve seen as far back as 2011. It is simple and mostly (but not exclusively) uses target markers to orient. Markers are flat images that are used to identify where the augmented content should go when you view a space with your device or smart glasses. However, it is the simple and practical nature of Augment’s platform that makes it interesting to me. What’s important here is that Augment has figured out a practical business model for Augmented Reality as this imaging technology begins its slow climb out of what Gartner calls the Trough Of Disillusionment in their Hype Cycle model for determining technology relevance. 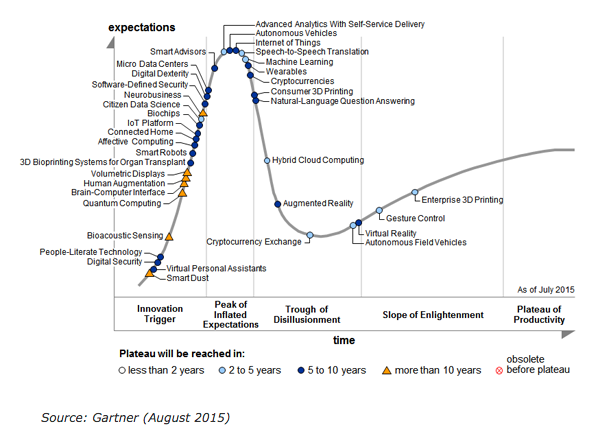 For the record, I’m not quite as pessimistic as Gartner is about AR’s climb to productivity. It’s nice to see the technology actually demonstrating value as a business tool instead of only behaving as a marketing enhancement like we’ve seen here and here. Additionally, I think it’s smart that Augment’s strategy is focused on building their own platform to ease repeated AR visualization efforts rather than causing sales reps and/or vendors to require single “one off” projects each time they need to realize their AR needs. Augment counts brands such as Coca-Cola Germany and L’Oreal among its 200 clients.